VANCOUVER - A beekeeper in Nanaimo, B.C., is the first to document what could be a devastating parasite in Canadian honey bees. Sarah Wallbank says she noticed bees from her hive were flying erratically at night, persistently circling lights and then dying. An online check led her to ZomBee Watch and its director, biology professor John Hafernik at San Francisco State University, who tracks the Zombie fly and its parasitic attack on honey bees across North America. Hafernik says Wallbank's bees are the first in Canada to be confirmed as infected, although hives are being checked in Victoria and Kelowna. He says the infection is concerning but not surprising, because the Zombie fly is native to North America and has targeted other native wasps and bumblebees. It appears only recently to have turned its attention to honey bees introduced by Europeans, however. Honey bees are a vital pollinator of agricultural crops and it's not yet known how severely the infestation will affect populations, so Hafernik is appealing for what he calls citizen scientists to watch for insects acting strangely. 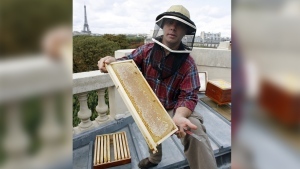 “By acting strangely, I mean flying around at night when they should be huddled, staying warm in their hives, and often getting attracted to light, which is sort of our indicator that something unusual is going on in the hive,” says Hafernik. Bees are likely infected while foraging, and become increasingly disoriented as the eggs hatch in their abdomens. “After about five to seven days, the larvae have completed feeding on the inside of the bee, they literally eat the inside out of the bee and they then kind of erupt out of the area between the head and neck of the bee, sort of like aliens,” he says. 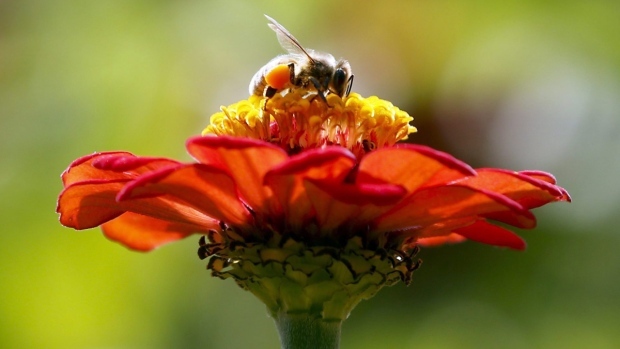 A map of infected bee colonies shows heavy infestations on both United States coasts and Hafernik says the big question is whether the bug has spread through British Columbia to Alberta and possibly Ontario. Anyone seeing bees attracted to light, especially at night, should carefully collect the dying insect and save it in a container or baggie, observe if any larvae emerge, and report to ZomBee Watch, he says. Hafernik says it has been “really great” making contact with citizen scientists such as Wallbank in Nanaimo, and her counterparts in Canada and the U.S.
“These are people who can make real scientific contributions and discoveries that have been missed by scientists like me and others over the years,” he adds.